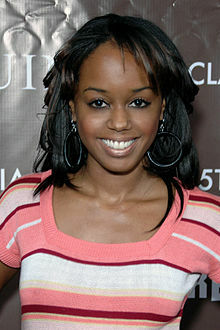 Jaimee Monae Foxworth (born December 17, 1979) is an American actress and model. She is best known for her role of Judy Winslow, the younger daughter of Carl and Harriette Winslow on the ABC/CBS sitcom Family Matters. Foxworth began modeling at the age of five, soon appeared in national television advertisements, and ultimately landed the role of Judy Winslow, the youngest of the Winslow family's three children, on the long-running sitcom Family Matters. After the introduction of Steve Urkel (Jaleel White), Foxworth's scenes were reduced significantly. The combination of the character having little to do on the show, and budget cuts, caused producers to eliminate her off the series after its fourth season. The character disappeared without explanation , with the Winslows acknowledging only two children: Eddie (Darius McCrary) and Laura (Kellie Shanygne Williams). With very little acting work coming in the years after Family Matters, Foxworth formed a R&B musical group, S.H.E., with her two sisters (Tyren Perry, Jania Perry). They released their debut album 3's a Charm on July 1, 1997 through Shaquille O'Neal's T.W.IsM./Interscope Records. Foxworth later switched to starring in a couple of pornographic films under the stage name Crave. Her transition to the adult industry was covered by The Oprah Winfrey Show in an episode, "Former Child TV Star Reveals the Biggest Mistake of Her Life". Foxworth battled substance abuse and depression. It was rumored that this was prompted in part by a judge's ruling that her trust fund of more than $500,000 be used to save her family from bankruptcy, but she denied this in a 2009 interview, stating, "I think [that came] from the National Enquirer. We never filed for bankruptcy. We were almost to the point where we were just completely flat broke but we never filed for bankruptcy." In December 2008, People magazine reported that Foxworth was pregnant. She and longtime boyfriend Michael Shaw were expecting a child in early 2009. On May 29, 2009, People reported that Foxworth and Shaw's baby was born, a boy named Michael Douglas Shaw, Jr. He was 10 days overdue, and Foxworth shared the news of his birth while still in the delivery room via text message. In autumn 2009, the TV One series Life After chronicled Foxworth's story, dealing with her departure from Family Matters, and her subsequent marijuana use, which she claimed to have stopped smoking. During the show, her newborn son was shown. ^ a b "Oprah: Former Child TV Star Reveals the Biggest Mistake of Her Life". ^ Family Matters – Jaimee Foxworth (Judy Winslow). Kellie-williams.com. Retrieved on 2011-12-29. ^ 3's a Charm: S.H.E. : Music. Amazon.com. Retrieved on 2011-12-29. ^ "Internet Movie Database - Jamiee Foxworth". IMDB. ^ "Jaimee Foxworth". NNDB.com. Retrieved December 29, 2011. ^ "Jaimee Foxworth Expecting Her First Child". People. December 29, 2008. ^ Hogan, Kate (May 29, 2009). "It's a Boy for Family Matters Star Jaimee Foxworth". People. Retrieved March 28, 2017. This page is based on the Wikipedia article Jaimee Foxworth; it is used under the Creative Commons Attribution-ShareAlike 3.0 Unported License (CC-BY-SA). You may redistribute it, verbatim or modified, providing that you comply with the terms of the CC-BY-SA.